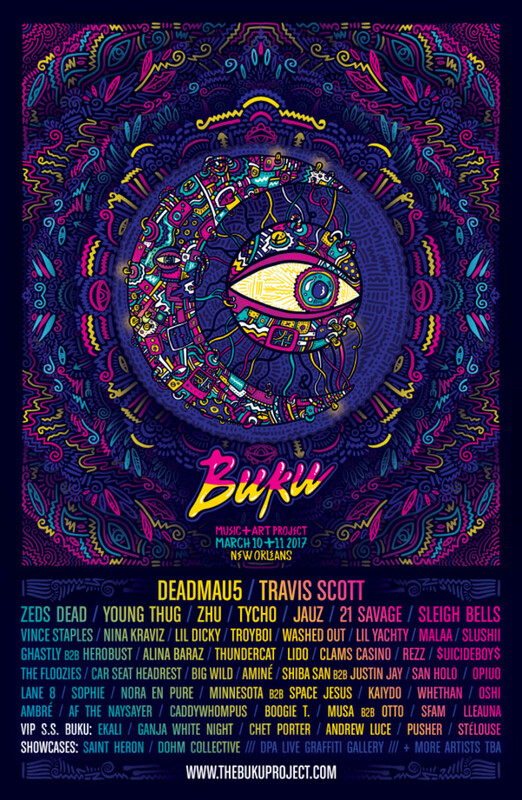 BUKU Music + Art Project is back for its sixth year and the initial lineup released today looks absolutely stacked. Among some of the more notable acts festival goers can expect to see next March include Travis Scott, Young Thug, Vince Staples, and Lil Yachty. The electronic scene is well-represented too, with Deadmau5, Zeds Dead, ZHU, Lido, and Jauz all set to perform. You can check out the initial lineup below which also features Alina Baraz, 21 Savage, Malaa, Clams Casino, and more. A portion of ticket sales will go to support The Upbeat Academy Foundation, an educational program for local youth in New Orleans that teaches them about music production. For their part, BUKU raised over $17,000 for The Upbeat Academy Foundation in 2016. For more info on BUKU Music + Art Project, which takes place March 10-11 at Mardi Gras World in New Orleans, visit the official website. Regular priced two-day passes will be available Dec. 8 at 12 p.m. (ET) for $189.99. Other ticket packages are available here.